It is increasingly becoming evident that L&D department in organizations can no longer function the way they used to, at least not if they want to be relevant and be a business partner to the organization. The impact of technology, globalization, ubiquitous connectivity, remote work and distributed work teams, and economy of individuals to name a few drivers have changed the face of workplace learning and performance dramatically. 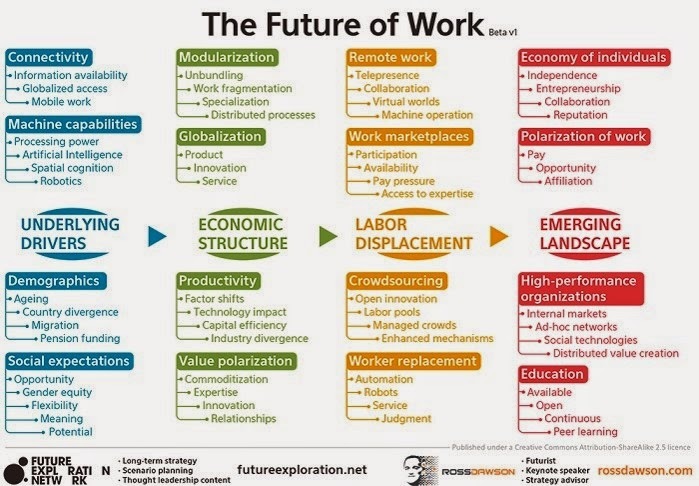 Refer to Ross Dawson’s The Future of Work for a detailed overview. Workplace learning in many places is still struggling to come out of the Industrial Era where workers were trained on best practices, put to work, and their efficiency measured by supervisors. The more of the same task they performed, the more efficient they became. And time to production improved. Economy of scale was achieved. Gone are those days and those requirements. Repeatable tasks are performed more rapidly, with greater accuracy and more cost effectively by machines. Somewhat complicated tasks are being outsourced but even the face of outsourcing is undergoing rapid change. But I will leave that discussion for another post. Ability to learn rapidly is perhaps the mega-skill that makes the rest possible. Today’s workers can no longer rest on their laurels and past success doesn’t necessarily imply future success as well. This is the world of work that L&D must support today. And this means reskilling for L&D as well. They must support an environment where continuous learning and innovation are the key differentiators. And this mega-shift calls for some key role changes and skill acquisition for L&D. From course designers to learning facilitators – Given that till date, L&D has been tasked with designing courses based on TNA, task analysis and skill gaps, this is perhaps one of the fundamental and most difficult shifts. While courses will still have their place, the approach to course design itself will need to become more dynamic, rapid and inclusive of informal and social components. The courses will serve very specific needs for specific groups. For a more holistic performance support and knowledge sharing, L&D will have to shift to enabling learning at an organizational as well as at an individual level. Some of the related skills required to do this are given below. Proficiency in social media usage – While we would all like to boast about being social media gurus, using it effectively for learning and enabling others to do the same calls for a different understanding of social media. It goes beyond a Facebook status update. It is essential that the L&D team members develop the skills of building their own PLNs. This will not only help them stay on the cutting edge in the space of L&D but will also enable them to support others in building their PLNs. This requires an ability to connect to the right people on social media, filter and curate the right content in the right context. Facilitating self-driven learning – As course designers and course disseminators, L&D role has been more of that of the sage on the stage. However, with the need for learning new skills becoming more dynamic and skill requirement more complex, workers must know how to “pull” what they need to drive performance. This requires them to reach out to the right people, access the right content and use their own PLN to acquire the information or skill required. All of this doesn’t happen overnight and requires time to set in place. It requires L&D to don the hat of coaches and mentors as well as facilitators who support at the point of need. Managing/facilitating communities and networks – IMHO, learning in the workplace will increasingly take place in communities – these could be communities of interest, communities of practice, or even communities formed out of project groups. Some will be temporary like those of people coming together for projects; some will be long term, like CoPs where workers from across the organization come together to evolve their domain, learn from each other and add to the knowledge pool. While people may still come together to share and learn as they often do without L&D intervention, support from L&D in this area will not only make it more efficient and bridge silos, it will also benefit the organization immensely by providing a platform for the capture of tacit knowledge residing within. Driving change management – L&D today needs to be the harbinger of change and also the driver. It is not enough to acquire the abovementioned skills and then expect the change to take care of itself. Moving to a new way of working and learning takes time, perseverance and belief from a set of people and L&D has to lead the charge. This means getting the buy-in of key stakeholders and talking the language of business. This also means having a very clear change management plan in place that includes various phases of the shift from short term goals to long term vision. Short term goals can focus on low-hanging fruits so that some quick results can be shown thus fostering trust. Bersin’s model below captures the shift. While the model has certain dates affixed to each stage, each organization will evolve at its own pace and the dates are indicative only. The capability to gauge what kind of support is required for optimal and timely output – a course, a Job Aid, initiating and facilitating a forum discussion, curating external content and sharing internally, and so on. The role of L&D will continue to evolve and expand. It is going to become strategic and critical but the onus lies on us to keep honing our skills and shaping our capabilities to meet the constantly changing needs of the workplace.